Thanks to one of our Fabulous Finders, we now know that it is a Croshetta Soother by Jellycat. 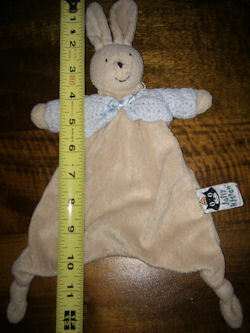 I’m looking for a Jelly Cat or Jelly Kitten 12 inch long cream rabbit lovey. The blue crochet sweater is not removable and is firmly attached to the entire arm as well as under the bow in front, but it’s not attached in back at all. As a surprise 30th birthday gift for my daughter, I would like to find a ”back up” for my 22 month old grandson’s lovey. My husband and I live 775 miles away from our daughter, son-in-law and only grandson, and when they visit I’d love to have him an extra lovey in case his ”Lovey” were to be lost. My daughter would love to have a back up in that case as well! Lovey has been discontinued and therefore we have been unable to find another one anywhere. We are all glad to help.